Dinosaurs grew as fast as your average living mammal, according to a research paper published by Stony Brook University paleontologist Michael D'Emic, PhD. The paper, to published in Science on May 29, is a re-analysis of a widely publicized 2014 Science paper on dinosaur metabolism and growth that concluded dinosaurs were neither ectothermic nor endothermic—terms popularly simplified as 'cold-blooded' and 'warm-blooded'—but instead occupied an intermediate category. 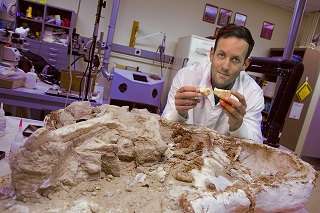 "The study that I re-analyzed was remarkable for its breadth—the authors compiled an unprecedented dataset on growth and metabolism from studies of hundreds of living animals," said Dr. D'Emic, a Research Instructor in the Department of Anatomical Sciences as Stony Brook, when referring to "Evidence for mesothermy in dinosaurs." "Upon re-analysis, it was apparent that dinosaurs weren't just somewhat like living mammals in their physiology—they fit right within our understanding of what it means to be a 'warm-blooded' mammal," he said. Dr. D'Emic specializes in bone microanatomy, or the study of the structure of bone on scales that are just a fraction of the width of a human hair. Based on his knowledge of how dinosaurs grew, Dr. D'Emic re-analyzed that study, which led him to the strikingly different conclusion that dinosaurs were more like mammals than reptiles in their growth and metabolism. Dr. D'Emic re-analyzed the study from two aspects. First, the original study had scaled yearly growth rates to daily ones in order to standardize comparisons. "This is problematic," Dr. D'Emic explains, "because many animals do not grow continuously throughout the year, generally slowing or pausing growth during colder, drier, or otherwise more stressful seasons. "Therefore, the previous study underestimated dinosaur growth rates by failing to account for their uneven growth. 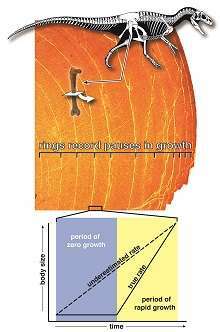 Like most animals, dinosaurs slowed or paused their growth annually, as shown by rings in their bones analogous to tree rings," he explained. He added that the growth rates were especially underestimated for larger animals and animals that live in very stressful or seasonal environments—both of which characterize dinosaurs. The second aspect of the re-analysis with the original study takes into account that dinosaurs should be statistically analyzed within the same group as living birds, which are also warm-blooded, because birds are descendants of Mesozoic dinosaurs. "Separating what we commonly think of as 'dinosaurs' from birds in a statistical analysis is generally inappropriate, because birds are dinosaurs—they're just the dinosaurs that haven't gone extinct." Dr. D’Emic holding one of the many dinosaur bones he examined under the microscope in his Stony Brook University lab. He explained that re-analyzing the data with birds as dinosaurs lends more support that dinosaurs were 'warm-blooded,' not occupants of a special, intermediate metabolic category. According to Holly Woodward, Assistant Professor in the Center for Health Sciences at Oklahoma State University, Dr. D'Emic's re-analysis is crucial to building research on the metabolism and development of dinosaurs. "D'Emic's study reveals how important access to the data behind published results is for hypothesis testing and advancing our understanding of dinosaur growth dynamics," said Woodward. Dr. D'Emic hopes that his study will also spur new research into when, why, and how pauses or slowdowns in growth are recorded in bones, which may have implications in the development of other species and in the study of bone diseases such as osteoporosis.